Issue 4 of Mark Millar’s run on Marvel Knights Spider-Man featured this terrific cover by the husband and wife team of Terry & Rachel Dodson. It works well on several levels – of course there is the obvious curvaceous female form that the Dodson’s are well known for. 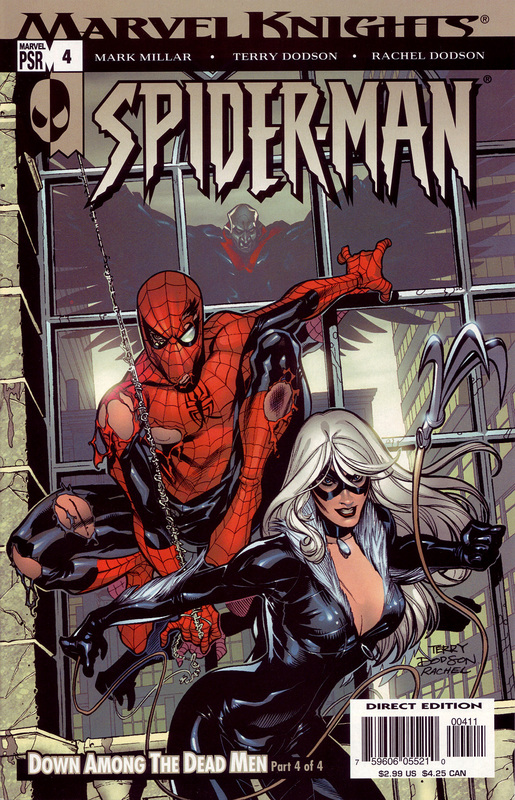 Then there is the sense of movement and action from Black Cat’s grappling hook toss to Spider-Man’s torn costume & the frantic look in his right eye. While your eyes are drawn to the drama in the foreground the image of the Vulture reflected in the window behind them is nearly unnoticed on first glance. Quite effective. THIS is how it’s done. Terry and Rachel should teach a class! Stop by tomorrow night for #94 in the big count-down of my Top 100 favorite comic-book covers. This cover tells a story, which is always good. I’m not big on cheesecake, so I would’ve preferred to have Black Cat’s zipper up a bit more, to make her look a little more ready for a fight.